LIGO and NANOGrav are complementary efforts covering different regions of the gravitational-wave spectrum. Pulsar timing arrays like NANOGrav are sensitive to gravitational waves with periods of years, while LIGO is sensitive to waves with periods near one-hundredth of a second or less. Other projects are working to detect the Hubble-length primordial waves that leave an imprint in the polarization of the Cosmic Microwave Background (CMB), while future space-based instruments such as eLISA are tuned to detect waves with hour-long periods. Each of these experiments explores different time scales, originating from a wide range of objects and phenomena in the universe. With the LIGO discovery, the field of observational gravitational-wave astronomy is now a reality. 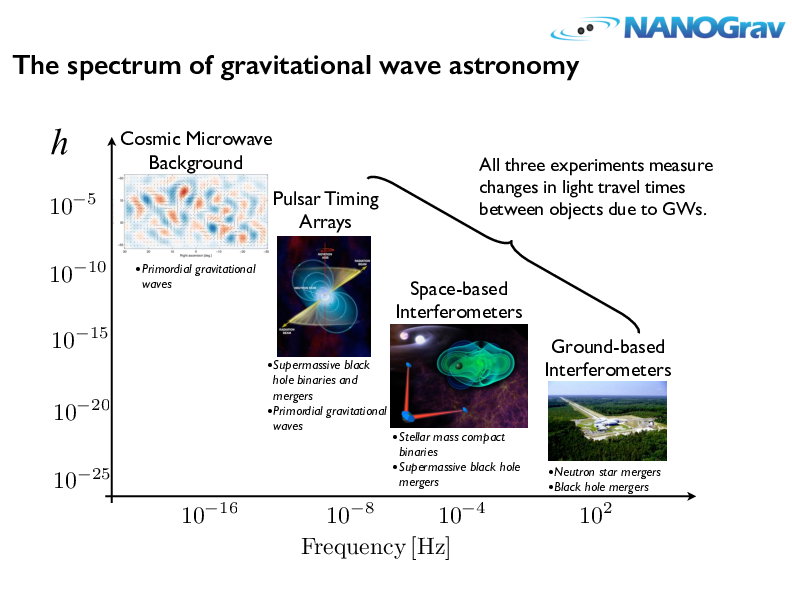 NANOGrav looks forward to to the detection of additional, and other types of, sources with results from LIGO and other ground-based instruments, as well as the CMB and eventually the space-based gravitational-wave communities. Together we are opening a completely new window on the Universe. About NANOGrav: Pulsar timing arrays are on track to detect long-period gravitational waves by measuring their effects on the light-travel times of pulses from rotating neutron stars (pulsars). NANOGrav monitors a set of pulsars that together form a Galactic scale gravitational-wave observatory. Our detector will be used to study supermassive black hole binaries in order to understand the morphology, kinematics, gas content, and feedback mechanisms of galaxies. Pulsars can also be used to detect gravitational waves from topological defects in space-time called cosmic strings, which are predicted by some high energy physics models.